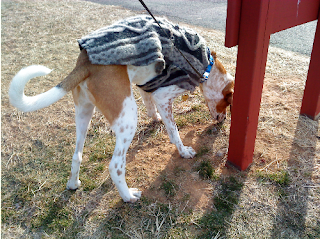 New on the runway this winter, a sniffing sweater, designed specifically for the sniffing dog. 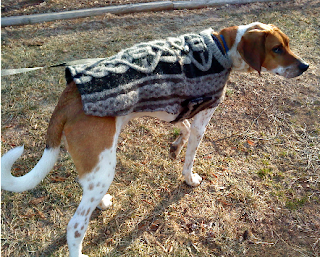 This repurposed knitwear, made from a felted celtic knit sweater (size immense), adds a dashing touch to any hound dog's wardrobe. 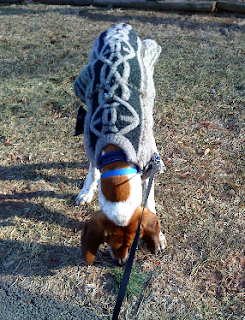 Although designed specifically for sniff-wear this sweater can also be worn while peeing on trees, posts, and clumps of grass. 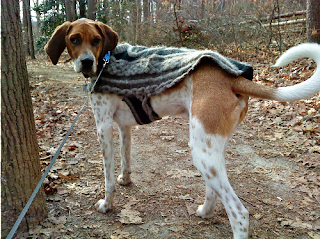 No fashionable hound's wardrobe will be complete without one. (Ray to grass) "Hey, didn't you used to live in my back yard?" You're not going to take my picture peeing are you? Nobody can see me in this, right? 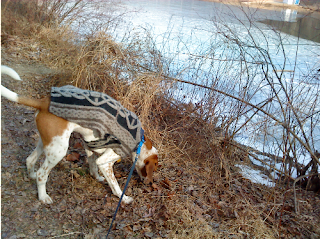 I got a man's sweater at an estate sale, then felted it and cut it up to make the sniff-wear. You can see a seam going across the back at the shoulder where I sewed a couple of pieces together. Super cool Ray, very 'dog about town' haha, love the captions, made me laugh out loud which is always good ! Great sweater! It's felted--wow, it must have been immense to the power of immense (as Evie would say).